How are your resolutions coming this year?? I've managed to stick to two... So far I've stuck to a healthier eating plan and I've kept up to date in my 52 weeks Traveler's Notebook Scrapbook! 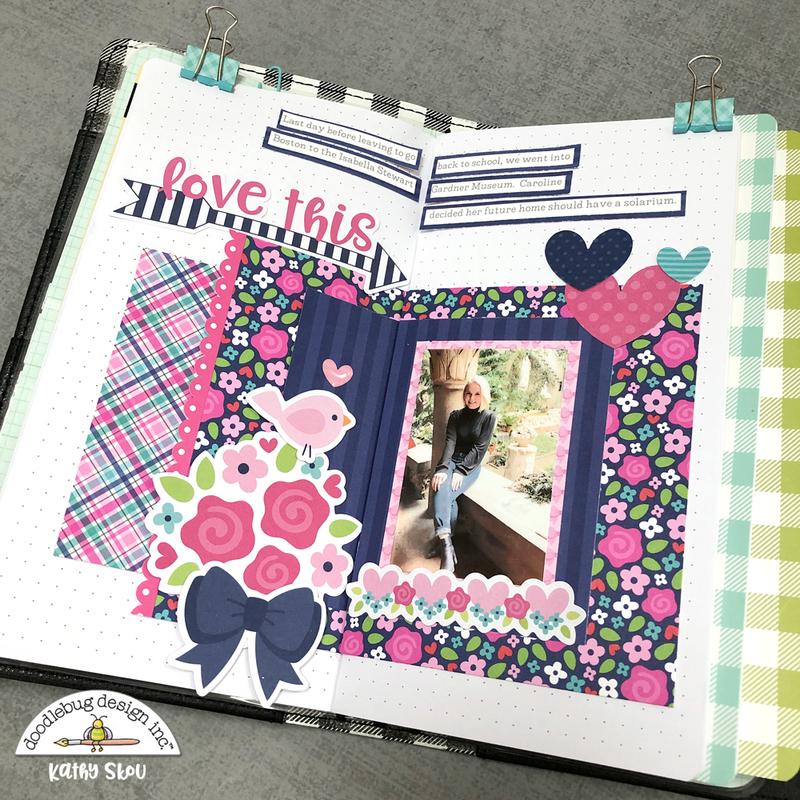 For weeks two, three and four I used the French Kiss Collection... take a peek! 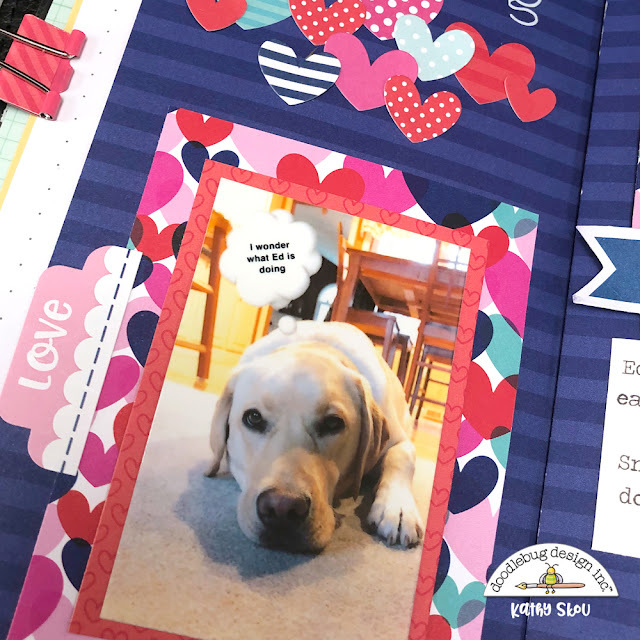 My first spread features one of my favorite pups. Maya is my neighbor's sweet dog... and Maya LOVES my husband. It's hysterical how excited she gets when she sees him. My neighbor jokes that if she wants to get Maya to go somewhere, she'll say... "Is that Ed? Go get him!" So of course when we get a funny SnapChat from Maya which says, "I wonder what Ed is doing...." we have to offer to take her for a walk. 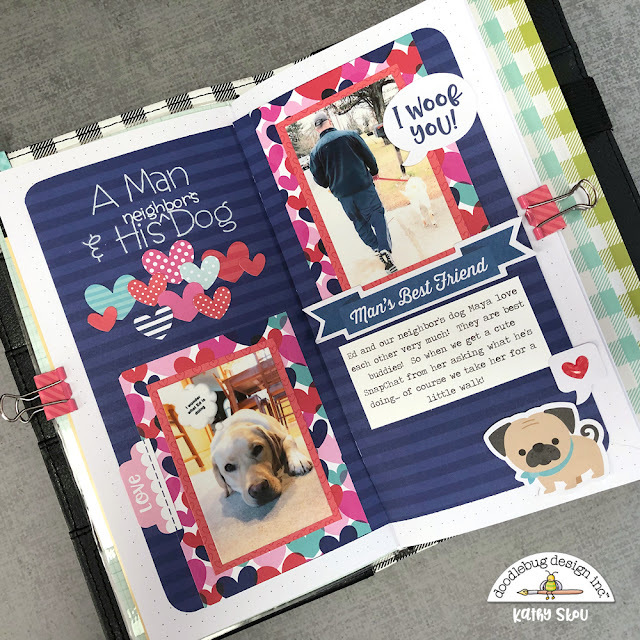 The hearts from the Chit Chat and Odds and Ends packs were perfect, AND I got to use the adorable Pug Odds & Ends Piece! My week three spread also features the French Kiss Collection. Before my daughter went back to school, we met up with one of my scrappy friends Mary-Ann for a fun girls day of shopping and lunch. While we were in one store, we had to try on the heart shaped glasses... and of course take a selfie of the event. 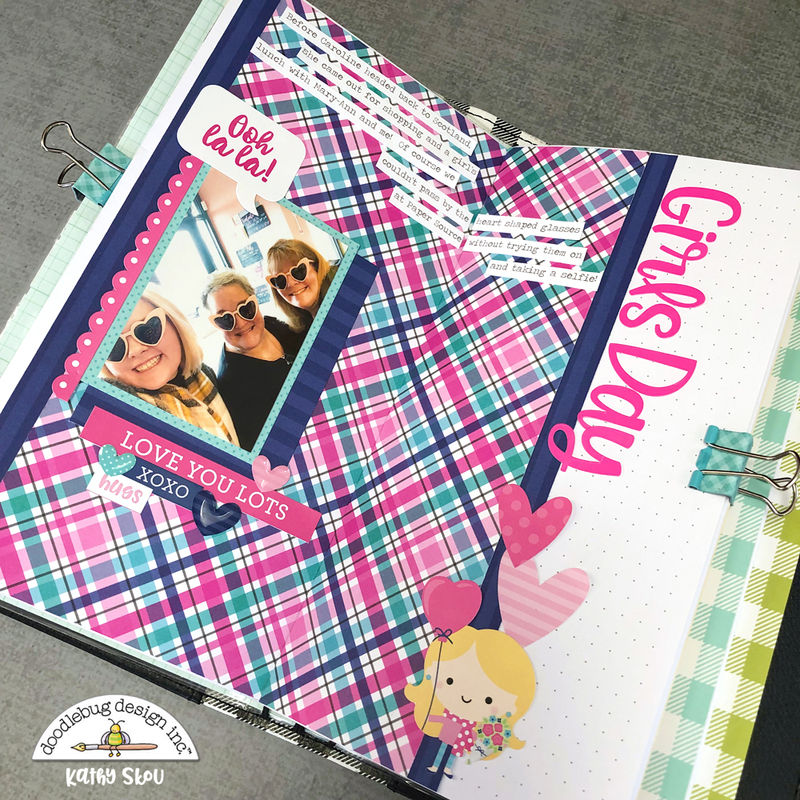 I think that the Passion for Plaid paper is my favorite of this collection! And the Ooh La La sticker from the This and That Stickers was perfect! I also love the Heart Throb Shaped Sprinkles... they add he perfect little sparkle and aren't too thick to be in my notebook. Week four is one of my favorite pictures of my daughter. Right before she left to go back to school, we took a trip into Boston and went to the Isabella Stewart Gardner Museum... the place is amazing! My daughter especially loved the solarium and decided any house she buys should have one! 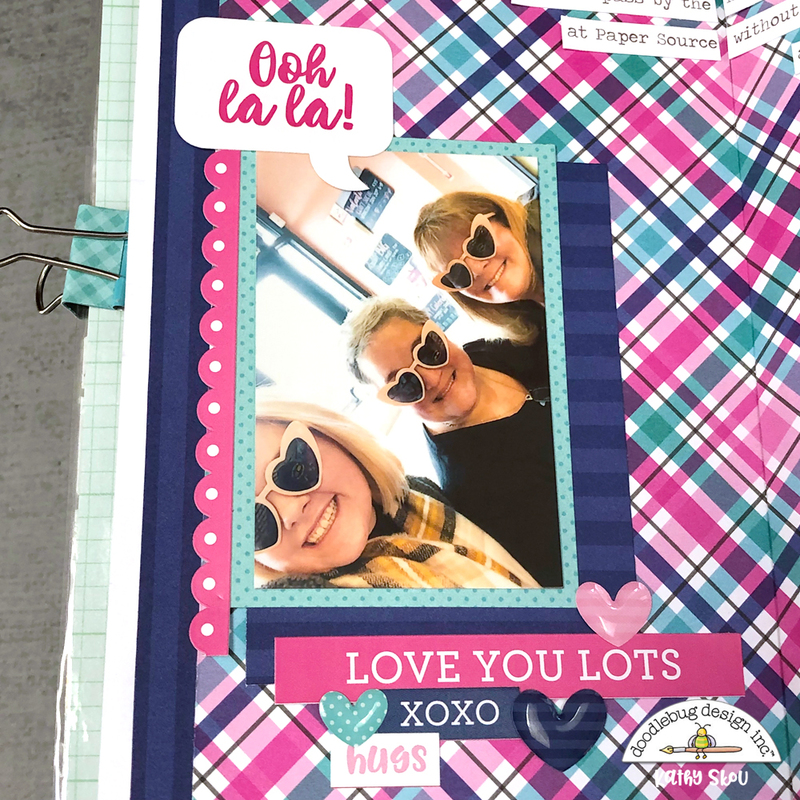 If you've used any French Kiss or other Collections in your 52 Weeks Scrapbooking, make sure to tag Doodlebug Design on Facebook (@Doodlebug Design) or Instagram (@doodlebugdesign). We would love to see what you've created! That's it for me today, thanks for stopping by to peek.